A Laundromat in GTA IV (Rear quarter view). The Declasse Laundromat is a laundry van featured only in Grand Theft Auto IV. The Laundromat is a Burrito, minus the Burrito's standard roof-rack, and with unique "Monthly Cycle Laundromat" signage; some standard Burritos are seen with "Spin on This Laundromat" signage, however these vans are not Laundromats. Its performance is identical to the standard Burrito. The Laundromat appears only during certain missions, and does not spawn in traffic unless a player is already driving a Laundromat. It is easily available in the Van category for multiplayer races, however. A Laundromat is also seen being driven in The Triangle as part of scripted traffic during a car chase in "Meltdown". In GTA IV, the Laundromat is first featured during "Hung Out to Dry", used by a laundromat owner who attempts to escape from Niko. 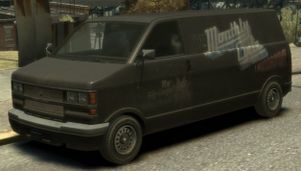 If the player goes around the back of the laundromat during the mission, rather than immediately confronting the owner, the van can be stolen and saved at a safehouse; this will, however, result in the player failing the mission. A Laundromat is also seen being driven in The Triangle as part of scripted traffic during a car chase in "Meltdown". This van can be stolen, but doing so will likely lead to a mission failure, as the target will have more time to escape. Also, in Luck of the Irish in front of Elizabeta's apartment there will be one there, it is scripted, but you may steal it - the driver will most likely be a member of the Spanish Lords and will attack you. A few Laundromat vans are seen parked in the Alderney State Correctional Facility in the final mission of The Lost and Damned, but they cannot be taken, as they are locked and Johnny won't break the window. Laundromat vans can also be found earlier in The Lost and Damned, when Brian's crew is driving during End of Chapter in Port Tudor. These can be stolen and stored at a safehouse. Despite having a different name, the Laundromat is offered as one of a variety of "Burritos" during selection of a vehicle in a multiplayer van race. The only way to identify the vehicle is through its company livery and the absence of a roof rack. The "Monthly Cycle Laundromat" signage on the Laundromat is a reference to the female menstrual cycle. The default radio station for the Laundromat is Liberty Rock Radio 97.8. On some very rare cases when the van is obtained, the cargo hold reveals baskets of laundry, and boxes of soap, found as such in the Laudromats around Liberty City. This page was last modified on 9 April 2014, at 23:22.